Self Supported Hydraulic Door Design . . . For Your Buildings! 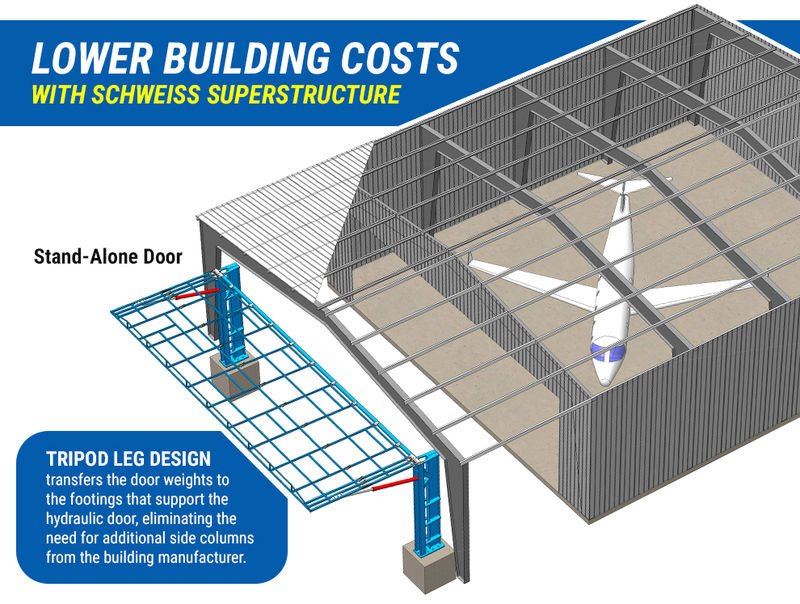 Schweiss has completely raised the bar in terms of hangar doors for general aviation and commercial jet hangars. We apply common sense and an innovative approach to provide you the right hangar door solution for your building. Schweiss realizes it’s important to understand what impact the hangar door will have on your building. Schweiss offers all hangar manufacturers choices when designing their buildings. Schweiss has the capability to manufacture a hydraulic door and framework that’s designed to help support the building structure. It is a freestanding hydraulic door that has its own superstucture framework attached and can be added to your new or existing building structure. It's all self contained so a retrofit is easy. This hangar door is so strong, but yet simple, that it requires nothing more than a common framed opening. 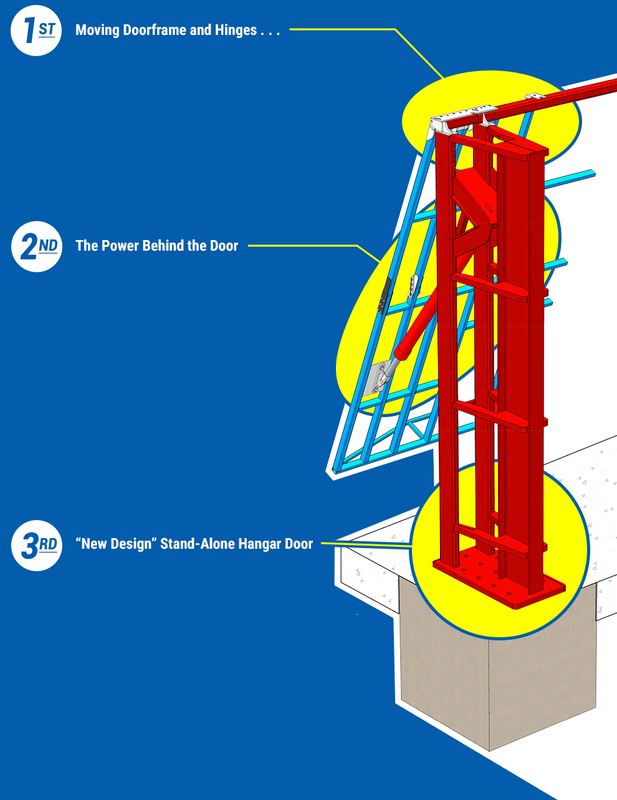 A Schweiss superstructure doorframe mounts on the ‘New Stand-Alone “Self Supported” doorframe; eliminating the need for the building manufacture to utilize a building truss or building header to support the hydraulic door on the hangar structure itself. This means you can reduce building costs significantly and gain headroom, saving everyone dollars. other's existing door models on the market obsolete." The three major components all connected together form a Solid triangle when the door is in any position. removable hinge pins for extended service life. Hydraulic doors have a huge advantage, by utilizing the major components for stability! The major components are all connected together to form a solid triangle when the door is in any position. By connecting all the major components together there’s a huge structural advantage and more important it adds stability to the door at all positions and allows for flexibility of the door and frame without binding on the cylinder pins and brackets. With all the major components connected, it at all time makes the door operation and installation so much stronger and stable in all positions. door operation and installation strong and stable. Hangar Door. This innovative hydraulic door is the only one of it's kind. We have taken our existing proven hydraulic door and now have even made it better! Schweiss is known for perfecting and developing better designed doors, and we have outdone ourselves again! Hydraulic doors have three major components, the cylinders, the doorframe and the subframe header. The three major components all connected together form a solid triangle when the door is in any position. By connecting all the major components together it comprises a huge structural advantage and makes the door operation and installation strong and stable. 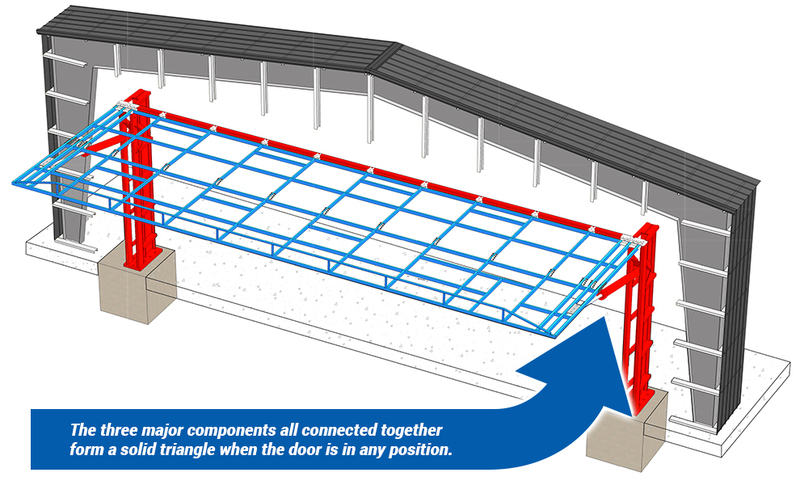 The three connected components below are what gives our door stability in all positions! Connects to the overhead structural subframe, that inludes a robust hinge design providing considerably greater surface area for distributing the load of the moving door evenly. The patented hinges include easy access greaseable lubrication zerks and removable hinge pins for extended service life. Support the sides and ends of the door in all positions. 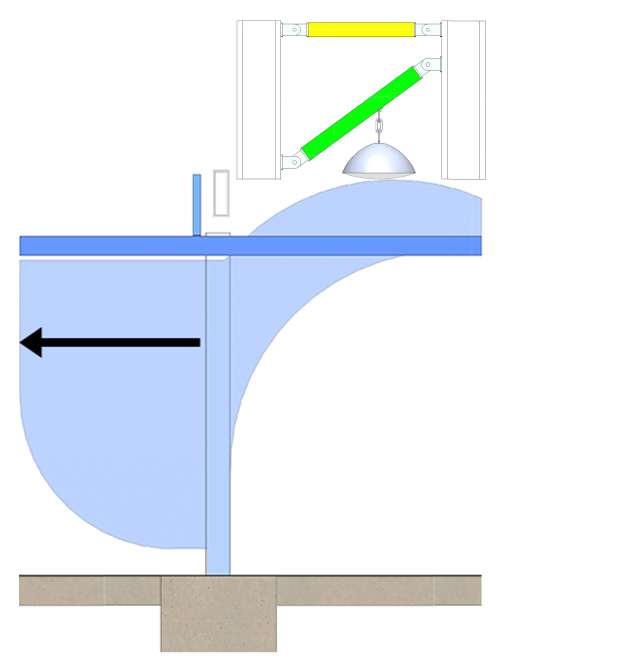 Spherical bearings connecting cylinders on each side of the door to the doorframe accommodate horizontal movement or deflection. They also allow for flexibility of the door and frame without binding on the cylinder pins and brackets. Attach to the Subframe Header providing the structural strength that carries the weight of a large moving doorframe! 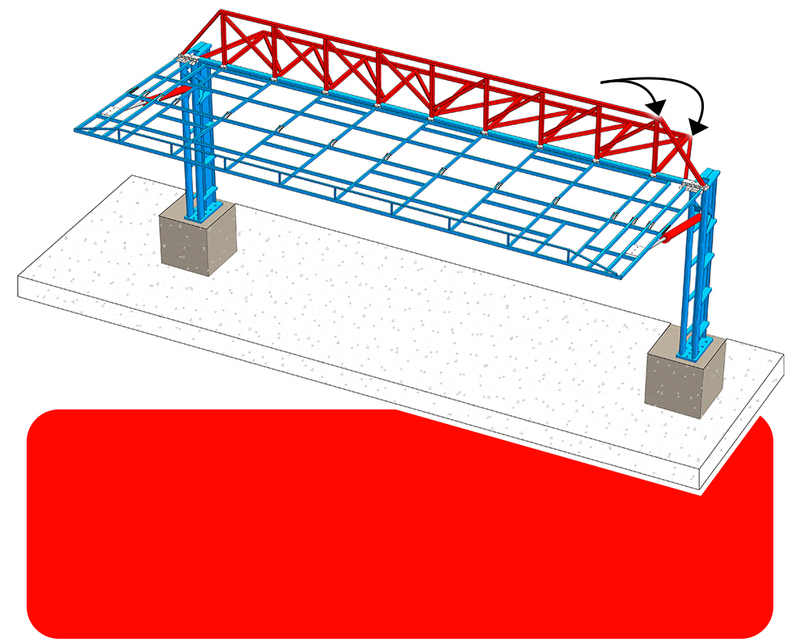 Tri-pod structure supports the door and hydraulic cylinders eliminating column twist, distributing the door weight and loads evenly into the concrete footer — the doors loads are transfered to the floor during operation, not the building. the footings that support the hydraulic door, eliminating the need fot additional side columns from the building manufacturer. 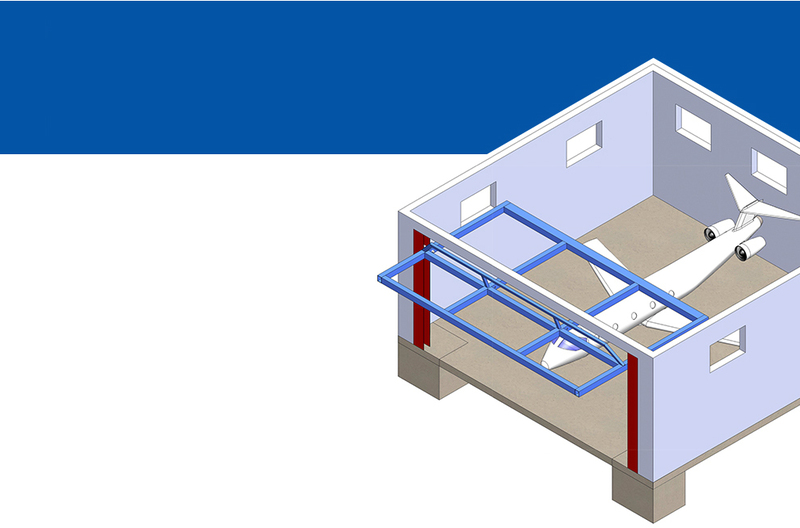 Building costs are significantly reduced with our Tri-pod leg design self-supported hydraulic doorframe. Schweiss is the leader in manufacturing hangar doors for general aviation and commercial jet hangars. Our self-supported hydraulic door is designed with a purpose and a clear objective. The self-supported design will benefit everybody from architects, engineers to building manufacturers, and more importanly will save money for the end-users of the doors. the surface, there really is no comparison! • Heavy-duty hinges are pre-welded to the doorframe and horizontal continuous member for ease of installation. • They are pre-assembled, pre-welded and delivered pre-hung within a pre-squared frame for ease of installation. Each door is fully assembled from the factory, saving you hours of installation time. Compare this to tilt-up doors that are shipped out in a kit form that consists of many bolts, steel members, cables and other components that have to be field-assembled and be field-squared up at the job sight. Assembling a kit door takes more time to install! • Makes installation easy; framework is standard on all Schweiss hydraulic doors – just lift the framework and door into place all in one step. Schweiss door framework consists of a continuous header that's factory fitted to the tri-pod cylinder legs. 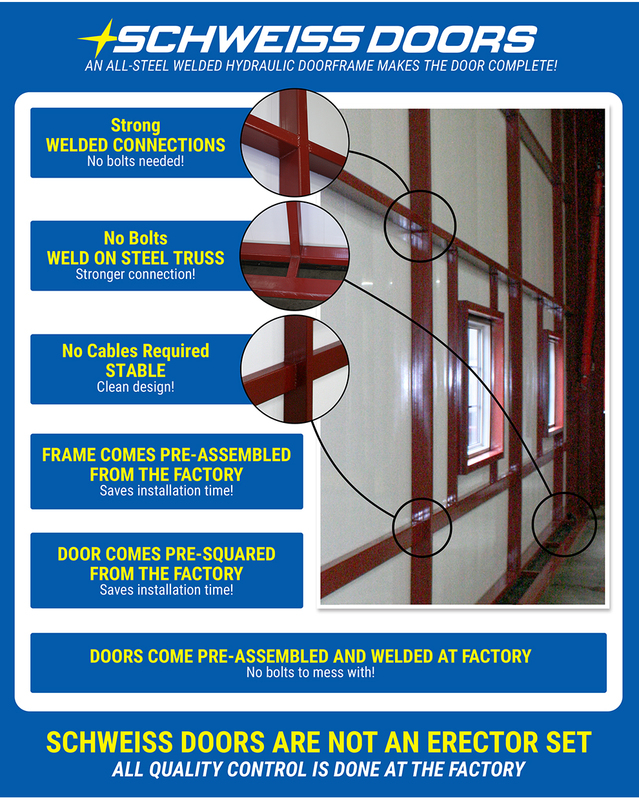 The doorframe is attached to the complete framework at the factory making installation easy. The framework adds extra building support. 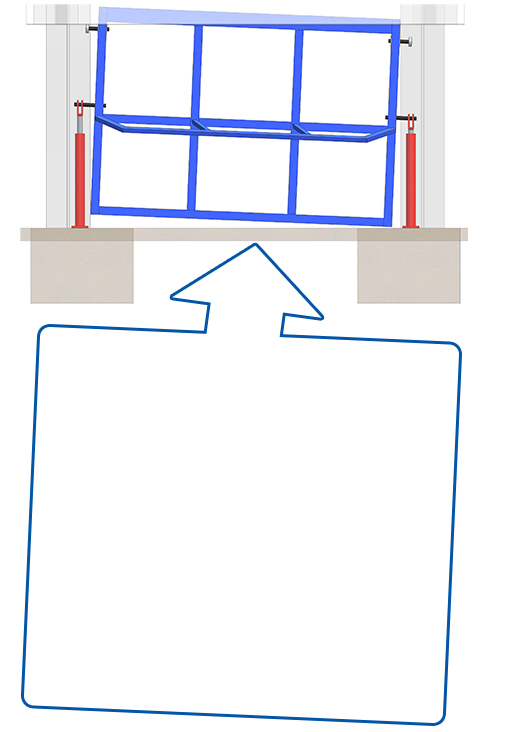 Schweiss self-contained framework simplifies installation. Self-Latching: Holds the door in place in the closed position ... never creeps open. The hydraulic pump has a built-in positive-hold valve that maintains and keeps the door locked in the closed position! Hydraulic cylinders automatically pull the doors in tight against your building and will keep the door in a locked position that provides a tight seal. Doors operate evenly in either direction secured by the heavy-duty hinges. 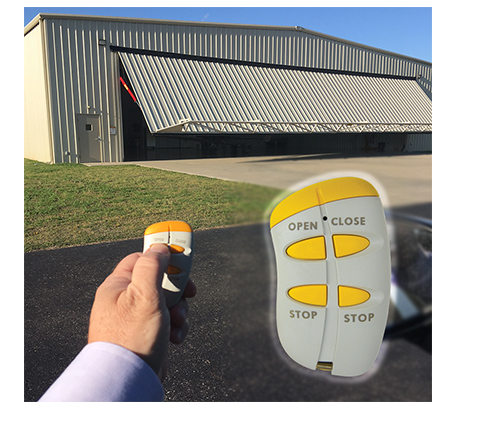 • Schweiss offers choices unlike others, we use common sense and an innovative approach to provide the right hangar door solution for your building. The complete hangar door system will save you time and money! • Reduce building costs significantly. Schweiss Doors come with their own door columns. 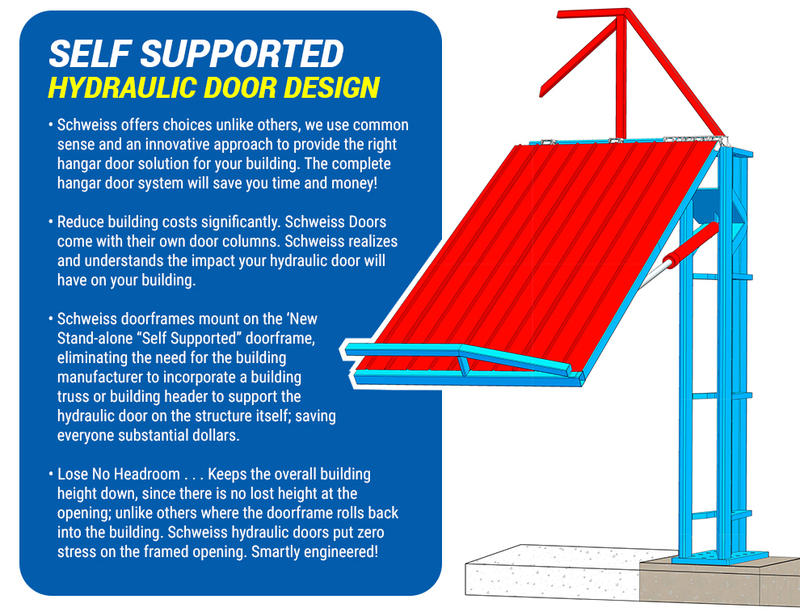 Schweiss realizes and understands the impact your hydraulic door will have on your building. ﻿• Lose No Headroom . . . Keeps the overall building height down, since there is no lost height at the opening; unlike others where the doorframe rolls back into the building. Schweiss hydraulic doors put zero stress on the framed opening. Smartly engineered! Schweiss hinges distribute the door loads evenly across the self-supporting subframe greatly reducing stress on the building structure. 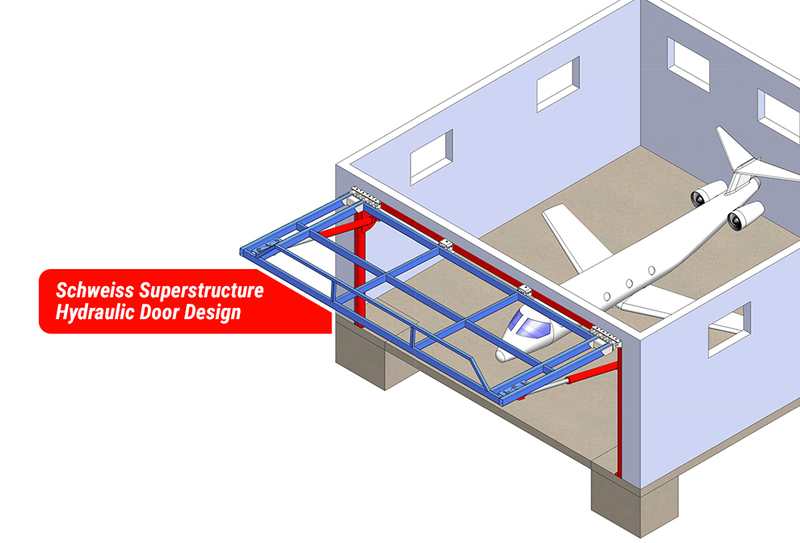 • Self supported hangar door is simple yet seamless in design. • Door does not put additional stresses on the building just to hold the door up. • Only a "Simple framed opening" is needed, helping save the end-user money. Building Companies Concerns . . .
the buildings structure to handle the loads of the doors, headers and door supports! 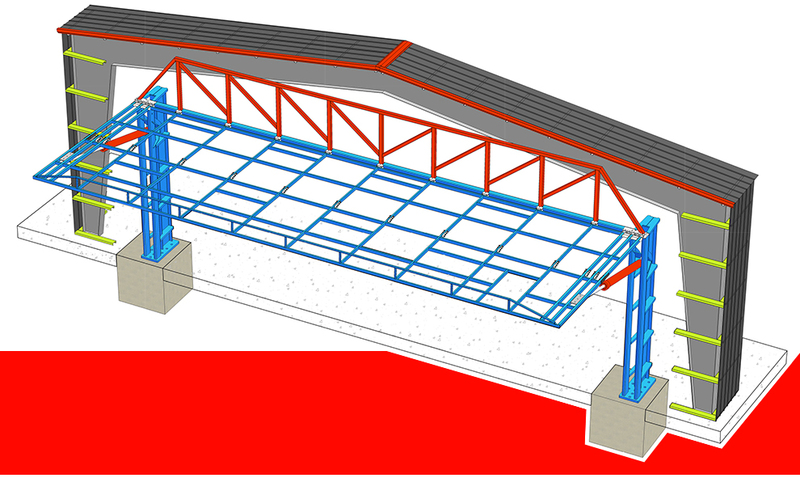 • You can reduce hangar construction costs and limit headroom requirements. • Helps with sustainability and design efficiency when designing a hangar building. • Helps eliminate major structural issues when designing the building for a door. supports. They will add considerable cost of which not all customers are not willing to pay for? • The more structural steel that can be eliminated from metal building cost helps everyone dollarwise! Simple Strong Design . . . Schweiss Strong! • Provides more of a "rain canopy" when open. • Provides more of a "shade canopy" when open. • Power up and power down fully automatic with remote control . . . No short cuts! • Once Schweiss doors are hung, there’s nothing to go out of adjustment. • Door swings outward, it doesn't impinge on the hangar or shop interior like tilt-up doors. • Schweiss doors have less moving parts, no rollers to keep from falling out of track, cams or slides. • Simple, solid design. Less Maintenance! Easier and Faster to Install! A customer once shared with us ... "A door is a door ... Right? WRONG! Like many people, I thought all hydraulic doors were pretty much the same, but boy did I learn my lesson. A hydraulic door is only as good as its components. Hinges, cylinders and workmanship, that's what sold me on the new Schweiss hydraulic doors. After helping a neighbor install and operate his Schweiss hydraulic door, I was sold right there, and from then on I knew Schweiss Doors were the right choice for me! The hydraulic door secret was no longer a secret. I proudly told my neighbors how happy I was with my Schweiss hydraulic door." A special feature of a custom-built Schweiss hydraulic door is that it comes pre-assembled, pre-welded and delivered pre-hung within its frame for easy installation. Schweiss welded doorframes have no bolts to jiggle loose and doors come welded up square from the factory and ready to install! A fully welded doorframe is stronger when all components are pre-welded in place! Welded doorframes are easier to install and install faster — no adjustments are necessary once the door is in place. This is a real timesaver for the erector that installs the door. The Schweiss Hydraulic Doors can be installed on any building, and best of all they still maintain the headroom requirements ... this is where you can save thousands of dollars by lowering the height of your building and still maintain needed headroom. 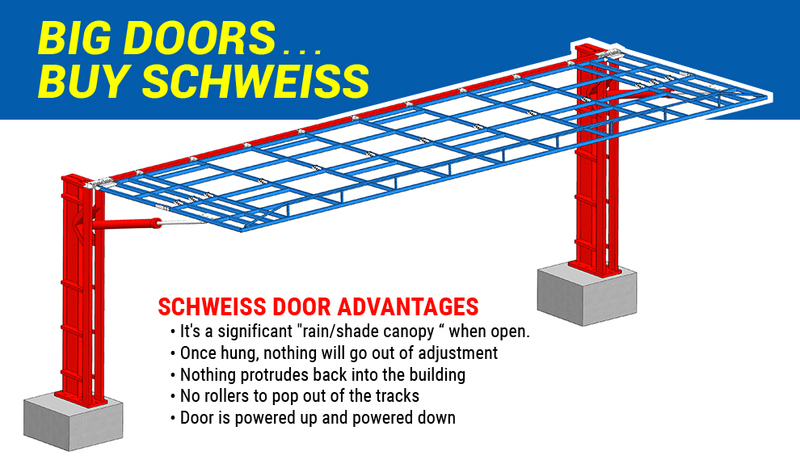 • Schweiss doorframe comes pre-assembled with its own header tube and vertical side columns that provide added support for your building structure. • The doorframe is pre-welded and pre-hung within the subframe for easy installation. • Pre-located hydraulic cylinder brackets and hinges make door installation easy. • The doorframe provides additional strength to your buildings. • All that’s needed is to lift the framework and door all into place in one step. saving time and money on installation. Let your next hangar door be a Schweiss! • It's a significant "rain/shade canopy “ when open. Hydraulic doors are large in size; the doorframe flexes during operation. The hydraulic cylinders on each side of the doorway are supported by the Tri-Pod leg design to support the cylinders evenly. • Tri-pod leg carries all the weight and forces of the doorframe and cylinders to the foundation. • Cylinder forces are supported equally on both the sides and back of the tri-pod leg. All the loads are transfered into the foundation. Hydraulic doors are large in size and just like an airplane wing, the doorframe flexes during operation. The hydraulic cylinders on each side of the doorway are connected to the doorframe and the building using spherical bearings. The spherical bearings accommodate the flexibility of the doorframe while at the same time allowing the cylinders to raise and lower the door without binding on the hydraulic cylinder pins and brackets. Spherical bearings on both ends of the cylinder allow the cylinders to stay straight throughought the full range of motion. "NO ONE ELSE IN THE INDUSTRY OFFERS SPHERICAL BEARINGS"
“No one else in the industry offers these unique features” Only available on Schweiss Doors. . .
Where are the hydraulic forces applied to the doorframe? The cylinders on these style doors that raise and lower the door are connected to a pin that is cantilevered off each side of the doorframe. Both pins and rollers carry the entire weight and loads of the door. These doors have two support points and two guide rollers! The hydraulic cylinders on Schweiss doors that raise and lower the door are connected to the doorframe between two verticle frame members. 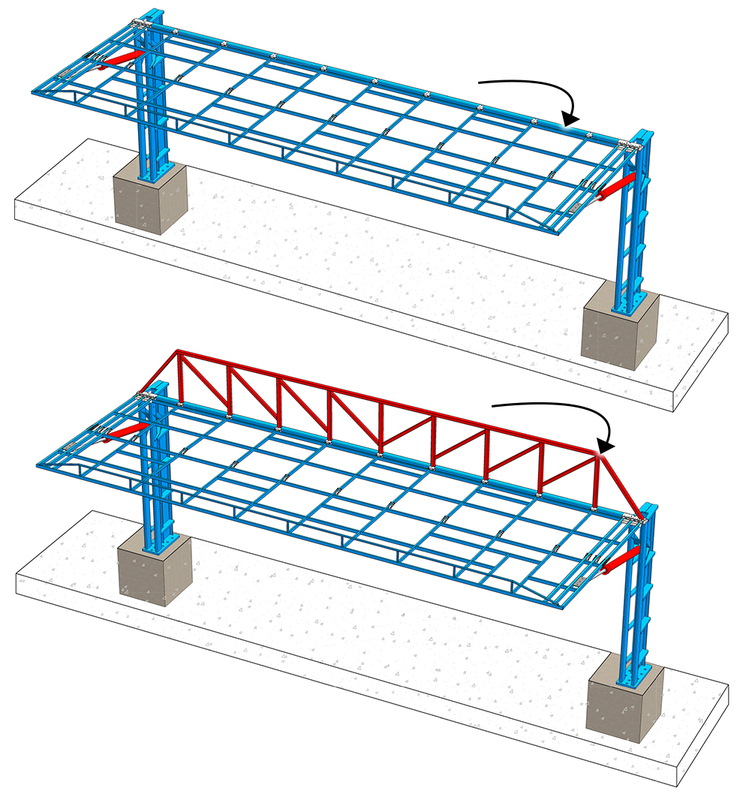 These verticle frame members balance the weights and forces on the hydraulic cylinders. Spherical bearings are also used to accommodate any flexing, making a strong and safe connection! Schweiss includes 6 to 24 hinges ( depending on the door size ) that are connected to the doorframe to help carry the weights and loads of the door! Schweiss doors utilize hinges to provide a strong connection and safe door! Schweiss hydraulic cylinders have a direct force on the doorframe, not on a cantileverer pin that sticks out the side of the door frame! Here's Why "You Want Hinges!" The Schweiss hinge has a Robust design over tilt-up hydraulic doors that have no hinges! Schweiss Hydraulic Doors are designed with heavy‑duty hinges that help carry the entire weight of the door when opening and closing! 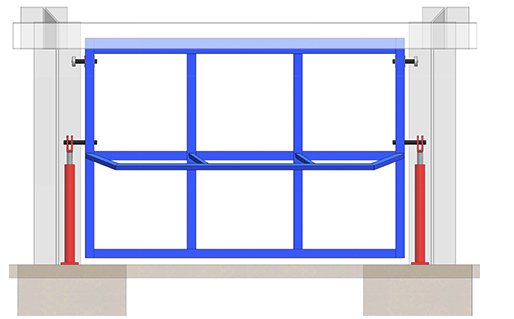 The advantage of heavy‑duty hinges on a moving doorframe is that they distribute the weight of the doorframe evenly across the subframe header to give the door stability in all positions! It's all about surface area. 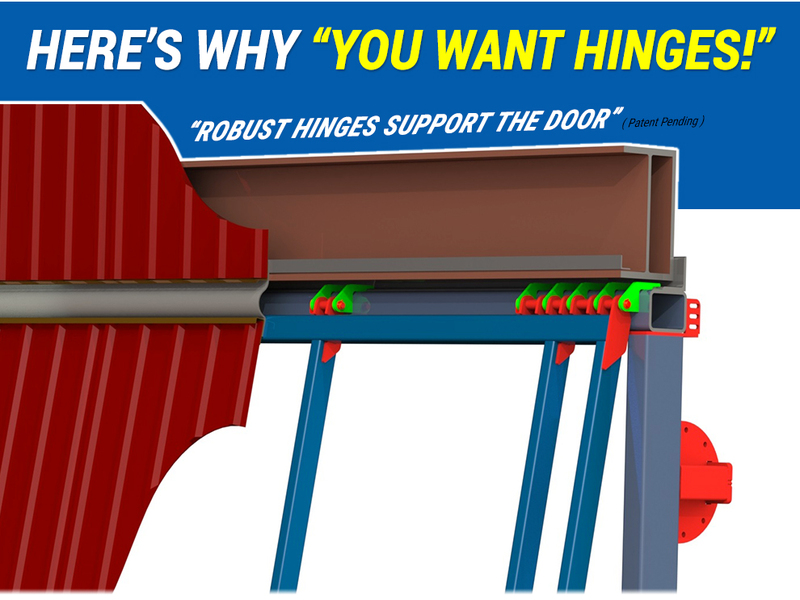 Schweiss hinges help spread the forces over a broader portion of the doorframe and header lowering the stresses that are transfered to the hydraulic cylinders and components of the door! • Schweiss . . . safety / stability / performance . . . no matter what size door. Hingeless Door Design . . . You sacrifice stabilty of the doorframe, making it harder to seal. Tilt-up Doors don’t use hinges on their doorframe to provide needed support and stability! The hingeless door design localizes all the forces to the very ends of the doorframe, relying on the cylinders and top rollers to support the door in all positions! The competitions hingeless door design does not utilize any hinges for additional support! The Schweiss design offers so much more and the robust hinges add stability to the doorframe and header! making your door significantly harder to seal. HINGES ARE THE SMARTER WAY TO GO ! Over the Years . . .
Schweiss has gained a lot of experience over the years. manufacturers come up with to open hangar doors. The mechanical ingenuity on display is fascinating! and now have made it even better! there is really... No comparison! Remember the Old Style Garage Doors? Some manufacturers have created an alternative by building a hydraulic door similar to the old style garage doors without hinges. The door, when open, rolls back into the building structure resulting in loss of valuable headroom, and it has moving parts, push slides, cam-rollers, and cam-tracks. The door, when open, teeters on two pivot pins and the cam-rollers ride in a track that protrudes back into your building. On tilt-up doors one-third of the doorframe slides back into the building when open, similar to the old style garage doors! There’s nothing tying the moving doorframe to a fixed header! The doors cylinders are the only things that attach to the side of the doorframe... that’s it. The door is guided by a set of rollers that go along for the ride by guiding / balancing the doorframe back into the building, again, resulting in the loss of valuable headroom! No Hinges / Less Support Hingeless doors have less support for a door. 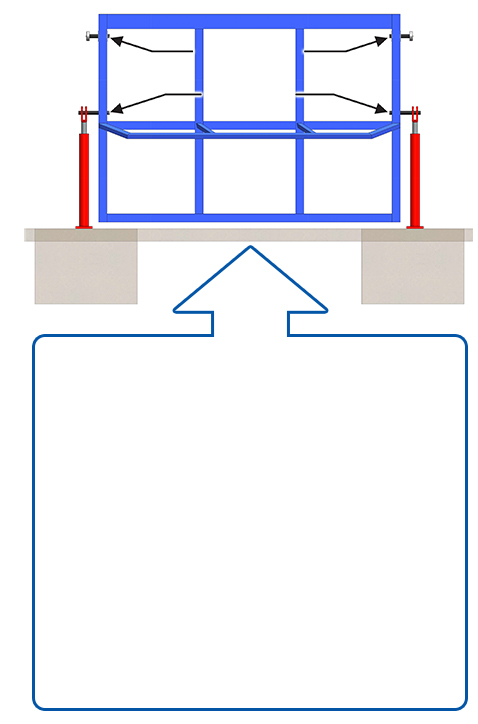 Only the outside cylinders and top guide roller that cantilever off the top side of the doorframe are guided in a cam-track as the door opens and closes. 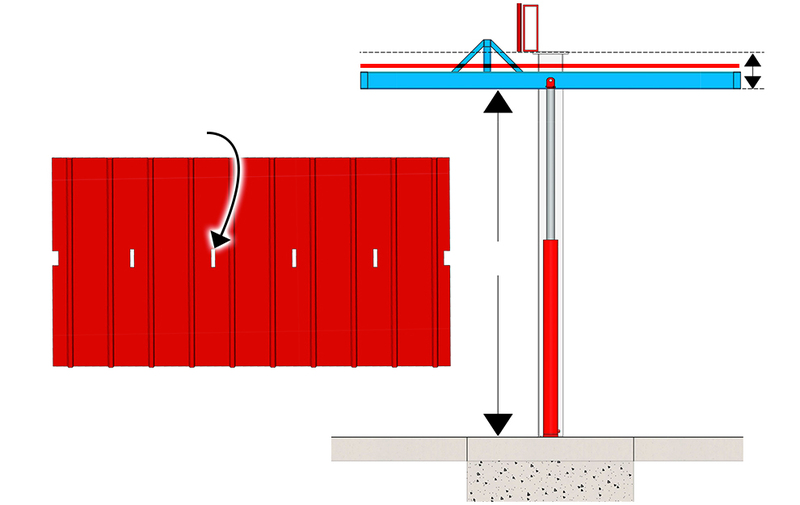 Doorframes rely on a shaft that cantilevers off each side of the doorframe that connect to a vertical hydraulic cylinder that raises and lowers the door. (Advantage of doors that have hinges allow for flexibility of the door and frame without binding on the cylinder pins and brackets). Really, No Hinges? . . .
And you still lose headroom! Door opens to the inside of the structure. When the tilt up door is in the fully open position, one third of the door slides back into the building similar to the old style garage doors — losing valuable headroom! Tilt-up doors obstruct valuable inside space when open and utilize a cam mechanism that travels within a framework, reducing headroom space inside the building structure. This costs you valuable headroom and space you paid for, in addition to blocking interior lighting! A customer told us “The headroom loss from a tilt-up door as compared to a Hydraulic door type was a deal breaker for me." Hingeless doors do not provide as much shade and will cover your lights inside the building when door is open! A hingeless doorframe sits in-between two columns. As the door opens it lifts up and floats inward simultaneously. The door requires a gap on each side with at least enough clearance for the doorframe to tilt back into the building as it opens! The gap on each side needs to be sealed! The doors are typically 1.5” to 3” narrower on each side of the framed opening! Note: Schweiss doorframes overlap the side columns two inches, not allowing any gaps! Doors are easy to seal when the doorframe overlaps the column; it’s harder to seal gaps when the doorframes do not overlap the columns! Schweiss doors are extremely weathertight and designed so the doorframes overlap by two inches on each side column making it easy to seal on the sides of the doorframe. The two hydraulic cylinders pull and power the doorframe securely and seal against the door columns! Unlike most tilt-up doors, Schweiss doors are powered down; Tilt-up doors float down into closed position and the doorframe does not overlap anything, leaving a huge gap that needs to be sealed off resulting in dust and dirt blowing through the gaps and cracks. The thing I like most about my hydraulic door is that it seals from the outside. Wind pressure seals it tighter instead of loosening the seal. COMMON CHARACTERISTICS . . .
Sealing the sides of the doorframe can be an issue when one side of the door raises or lowers slower than the other side. Doors that move unevenly when opening or closing will not be square within the opening! Any door that keeps shifting, even with the slightest movement from left to right or when closing, causes irregular gaps between the seals along the vertical edges requiring constant adjusting of the seals or replacement of damaged seals, which also make it harder to provide a tight seal! Doors that are not powered down, float down under their own weight; and not always evenly. Doors that do not seal well . . . cost more to heat !
. . . cost more to cool ! By design, tilt-up doors do not contact the side columns, leaving a huge gap that needs to be sealed to keep the outside elements out of your building! When operating the door any slight movement from left to right causing irregular gaps that are challenging to seal! The tilt-up door require two seals on both ends of the door. One seal mounts to the vertical column the other seal mounts to the doorframe. Both seals will be rubbing against each other when opening or closing. By design this door rotates as it opens — the doorframe rolls up and tilts inward into the building and the bottom tilts outward; both seals will be rubbing against each other as the door opens and closes. Maintaining a good seal can be a real challenge; keeping the weather seals intact and in place with every cycle! With a tilt style door containing no hinges you get less stability. There are no fixed connections to the doorframe other than a cylinder on each side of the doorframe. These cylinders do not pull the door downward, it just floats downward. Even the least amount of snow or debris under the doorframe or a frost heave on the outside ramp will result in the bottom of the doorframe sitting slanted and not level with the floor. When a door just floats down instead of being powered down by its cylinders and pump, the bottom seals cannot do an adequate job of sealing the door in the closed position. This creates a gap on one side and a tighter fit on the other side resulting in an open gap or crack that will allow daylight dust, dirt and snow to blow inside your building or even unwanted rodents to come inside. The large tilt-up doors can move left to right inconsistently when closing causing irregular gaps along the vertical edges, header and sill. The tilt-up door requires weather seals at the top and bottom, with double seals on the sides. Nothing seals better than a Schweiss Door. Others companies ship their doors broken down as a bolt-together kit; a giant Erector Set with lots of bolts, small parts and cables to deal with! If by chance the kit is missing components or not assembled correctly it’s gonna cost somebody extra time and money! Usually it ends up costing the end-user more when that happens! Installation of bolts and cables on a moving doorframe is critical and is all up to the erector to do a good job. Are all the bolts tight? Did you miss any? Do I have the doorframe square? Did I bolt the truss in place? This all sounds like a real timely undertaking to install a kit door! Kit doors may save manufacturing time, but add more time for the installers to assemble the door at the job site! Schweiss doors are pre-assembled, pre-welded and delivered pre-hung within its own doorframe for easy installation. Will a kit door be as strong as an all-welded doorframe? 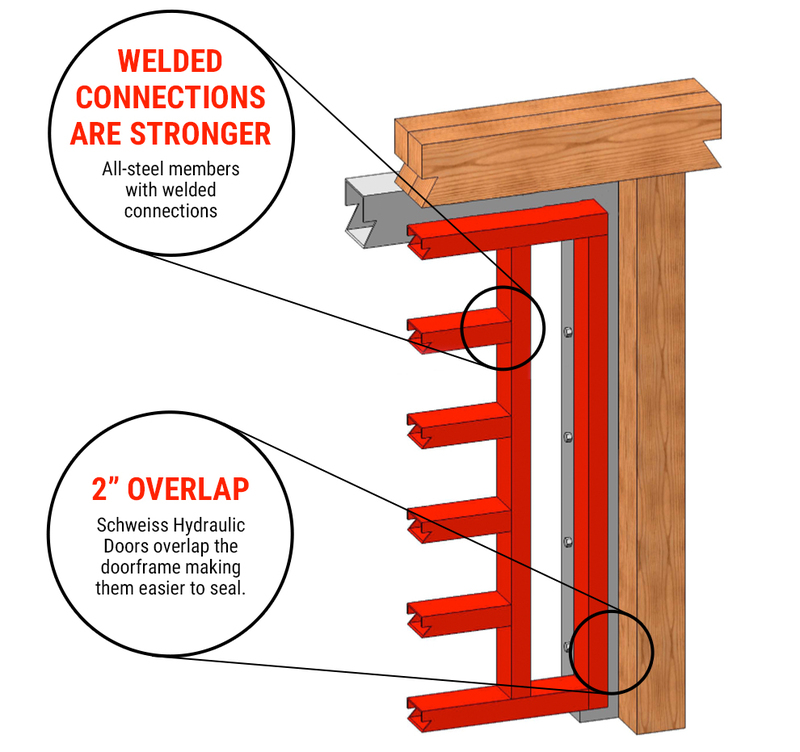 Welds never work loose and are a much stronger and permanent connections — welds never need to be reinstalled or tightened. Schweiss doorframe members are shop-welded, the doorframes are manufactured square from the factory; meaning less field labor is required. 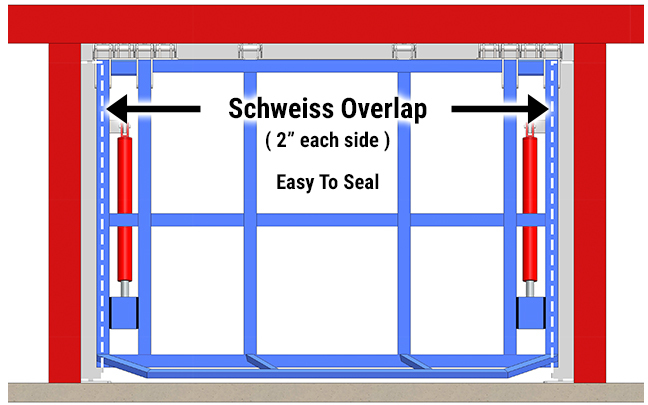 Every member of an all-steel door from Schweiss is positively welded in place. There are no tedious bolts or cables to install. Other Things To Remember About Tilt-up Doors . . .
• Tilt-up doors require a minimum 6” to 12” of headroom and more! extends out the side of the doorframe. 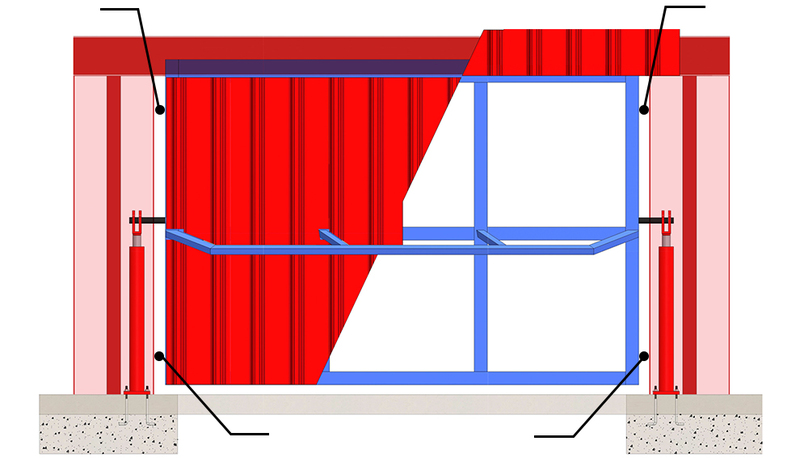 • Tilt-up doors require a bigger foundation support to carry the loads. the building, similar to the old style garage door – taking up headroom. Lots of Parts... lots of bolts... lots of time to install... and field assembling too!
. . . cost more to heat ! TAKES MORE TIME TO ASSEMBLE??? An external doors truss mounts near the center of the doorframe. When cladding/sheeting the door, the sheeting is notched/cut out around the center truss brackets. They need to be caulked to keep moisture out! The external truss near the center of the doorframe has to be sealed to prevent moisture or rain from leaking through. Doors lie flat in the open position. AN ALL-STEEL Welded HYDRAULIC DOORFRAME MAKES THE DIFFERENCE! No bolts to mess with! The Hydraulic Solution . . . Simple Concept and Seamless Design . . . Mike Schweiss, President of Schweiss Doors, says hydraulics are a powerful, clean, simple, and trouble-free method of operating the doors, and they operate smoothly and quietly. He says the company uses cylinders with larger rod diameters than required for added strength and safety — with rod diameters from 1½ inch to 4 inch, depending on door height, size, and weight. He also notes that the cylinders are beefed-up and strengthened at critical points to avoid putting stress on the cylinders or cylinder pins. Hydraulic Safety . . . Because of their size and weight, large hydraulic doors require safety features to prevent damage or injury from uncontrolled closing due to a power outage or failure of a hydraulic line. 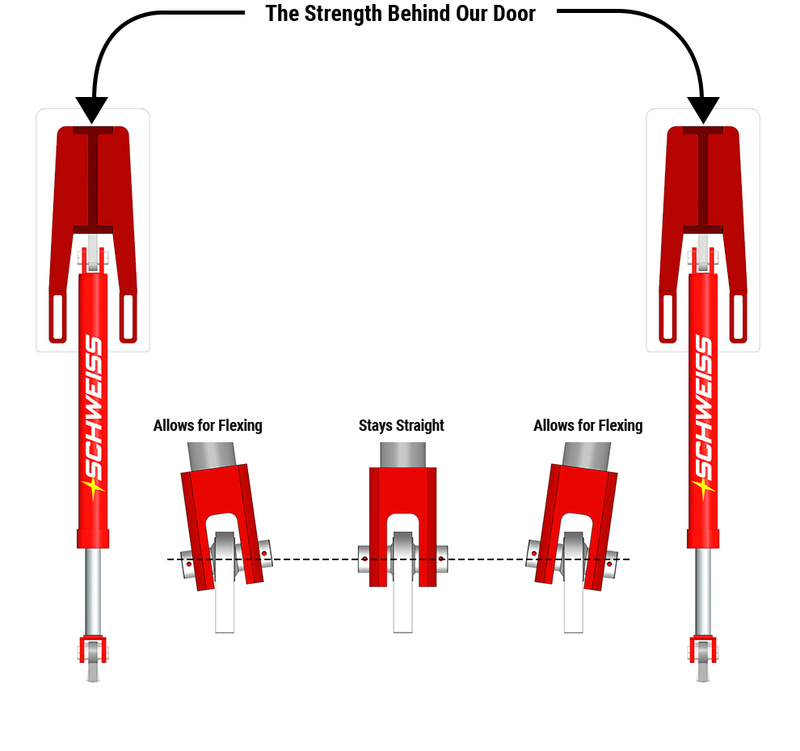 Schweiss incorporates counterbalance valves on all doors, causing the door to lock instantly in any position when not being operated, even if a hydraulic line should leak or burst. Pumps are driven by continuous-duty motors protected by fuse and overload devices. Low-voltage 24v DC control stations with low-voltage coil connectors provide greater user safety. the door in either direction if necessary. The Hydraulic System . . . Power Up and Power Down . . .
the filter element, this also reduces any chance of an oil mess. the pump pressure used to open the door. close to the door or further away. UL-listed electrical components are housed in control boxes, including contactors, transformers, relays, motor timers, rectifiers, and control fuses. The gear pump is 95% efficient and operates quietly at 1,800 rpm. The HPU also incorporates a 3,000-psi pressure gauge, fluid temperature gauges, and a service filter. ﻿Hydraulic Cylinders Handle Heavy Doors . . . Hydraulic cylinders provide the strength and reliability to open and close large, heavy doors on airplane hangars as well as agricultural, commercial, industrial, and residential buildings. They offer smooth, quiet operation, and the one-piece doors create a large, shaded canopy when open. Hydraulic systems are often the first choice for opening and closing gigantic one-piece doors used on airplane hangars, agricultural buildings, and structures requiring large openings, sometimes exceeding 100 ft. in width and weighing well over 10,000 lbs. These doors need powerful mechanisms to operate smoothly and dependably. 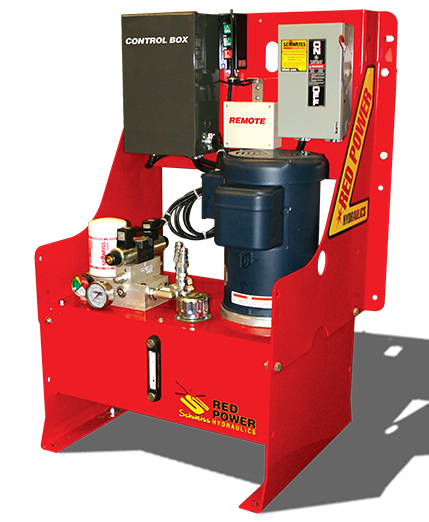 Hydraulic power is ideal and adaptable to any size door by increasing cylinder size in proportion to door size and weight. one-piece doors must be pivoted from both sides, hydraulics is generally used. antennas are included with each door. area that the door is about to open or close. you buy a door without remotes!"